This is my first foray into book reviews, so bear with me. I’m also going to tell you straight away that I have not read through all 312 pages of this amazing book, but what I have read has been incredible. Now out from Titan Books is a second edition of Matt Taylor’s Jaws: Memories From Martha’s Vineyard, which recounts the making of Steven Spielberg’s blockbuster Jaws from December 16th, 1973 all the way through the premier of the film on June 20th, 1975. The book has a great preface from Jim Beller, who helped compile the photos, about how he got involved in the project, as well as an introduction from author Matt Taylor. There’s also a really great foreword from Spielberg himself, thanking the town of Martha’s Vineyard for all their support during the making of the film and apologizing for not really noticing them while in his directing frenzy during the shoot. It’s heartfelt and sincere. The book is broken into six chapters, each looking at a specific time in the film’s production. Each chapter is chock full of behind the scene photographs, newspaper clippings and anecdotes from those who worked on the film. There are anecdotes from the production designer, special effects artists, boat operators, extras, cast members, various other crew members and even co-screenwriter Carl Gottlieb. 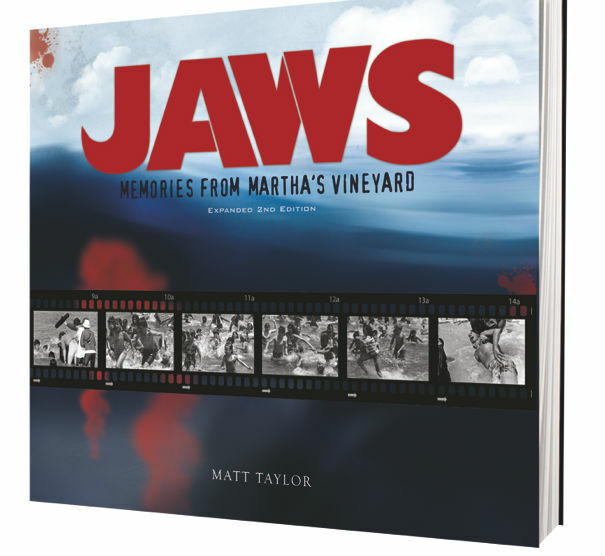 Posted on October 3, 2012, in Books on Film and tagged Books on Film, Jaws, Jaws: Memories From Martha's Vineyard, Matt Taylor, Steven Spielberg, Titan Books. Bookmark the permalink. 4 Comments. I am not sure I have the dvd! Must check! Love this movie.